Hemmed In By A Pony & Cart at Lignières Sonneville! I finally managed to get the letters posted home before we left Coulon. We sorted out our co-ordinates for today and told Sally and Dory where we wanted to go. We’re even on the road by 12.20 – something of a record. Sometimes all the preparation in the world doesn’t prepare you for what’s ahead! The day started off well but went rapidly downhill. We couldn’t find a petrol station selling diesel for an amount that Alan was happy to pay until he spied one beside a Carrefour supermarket – with three lanes tighter than a ducks wotsit. He managed to maneouvre the van into one lane only to discover the machine was out of order and had to reverse out again and go into another lane. We managed to fill up with diesel and got back on the road. The two satnavs were telling us different things and took Alan through a very small village – telling him to take “the next sharp right” up a tiny street with old french buildings right down to the edge of the road. There was not enough room to squeeze the van round so we are now sporting our first battle scar – a huge scrape up the drivers side and the rubber side bumper sheared up. Hopefully we haven’t taken any of the ancient stonework off the building! We arrived at our first choice aire only to discover it was in the middle of nowhere and up a very narrow lane which we could never have turned Kelpie into, so we dismissed this and entered our second set of coordinates. All was going well until SatNav Sally disappeared up her own arse and we ended up lost in the french countryside. Both satnavs where sending us in opposite directions again, but Alan chose to follow Google. We weaved our way through some twisty country roads until eventually the road turned into a lane-way with a maximum weight restriction of 3.0 tonne. Kelpie is 7.5 tonne and the look on the face of the approaching elderly driver as he chugged up the narrow lane was a picture. With the sun setting rapidly we only had about an hour of daylight left, no street lights and absolutely no idea where we were. We had to negotiate a 5 point turn into someone’s driveway entrance to turn around and we back tracked to follow Chinese Sally’s directions. Pitch black at 18.00 and we are still blindly following Sally and Dory in two directions until we eventually spotted the aire sign at Lignières Sonneville – thank you God. The only other residents in the aire were some new age travellers in their two converted horseboxes. From the plant pots on the back step and the electric lead (plugged into the only electric point) I assume they are long-term residents. I was too tired for cooking so had a tin of soup and a 3-day old baguette. An early night I think. It seems we have picked the day of the local Christmas Fair (again) and woke this morning to the sound of cars parking all around us. We’re boxed in so our plan for a long driving day on the deserted French roads on a Sunday seems not to be happening. Nothing else for it, we took a wander over to the fair – set in the old restored barn of a Chateau, which now houses the local council (Mairie) – a beautiful location for a Christmas Fair. There were lots of handcraft stalls and local produce. We bought some local honey and a chorizo then walked up to the boulangerie which had closed 10 minutes previously for the day (of course it had!). So we may as well have a wander around the village. 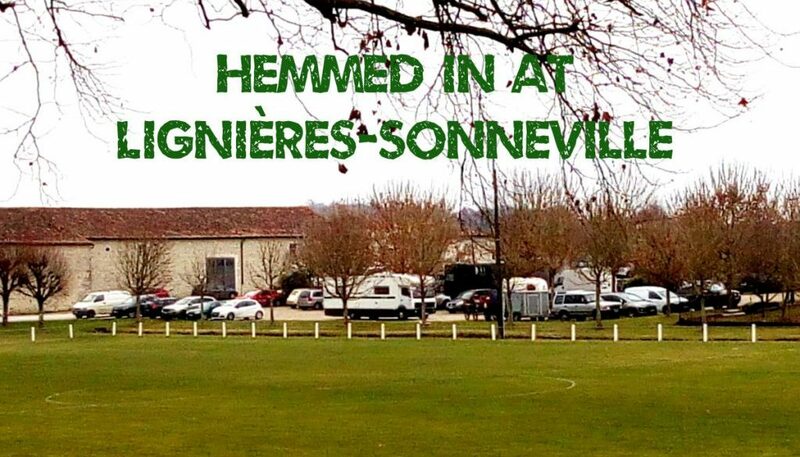 Lignières Sonneville is a small traditional French village in the west of France located in the Charente region. It retains all of its links and charm of the past. The chateau is completely surrounded by a moat, fed by the Le Collinaud river. A pony and cart takes children on a trip around the village whilst a lone fisherman tries his luck in the front section of the moat. Crossing through the grounds of the chateau takes you to the village church. Facing the front of the church are two interesting walled off areas. The first is a walled herb garden cultivated over decades by a past resident perfumer and now maintained by the council, containing rare ancient herbs and fragrant plants from around the world. Beside the herb garden are the old village public laundry area, the Lavoir. Village women would wash the clothes in the water troughs scrubbing them on the stone sides. On through the village contains a certain rustic charm from days long past, except for modern cars, post boxes and plastic wheelie bins! We arrived back at the van to see the horse from the horse and carriage rides having his lunch tethered up 6 feet away from the front of the van – so we’re not moving in the short term (I swear I’m not making this up). The new age travellers appear to be dismantling their two vans one bolt at a time and reassembling them – lots of sawing going on and lots of handknit jumpers, dreadlocks and DM boots oh and a tiny baby strapped to its mum while she sweeps out the van – now THAT’S wild. Once the horse and cart resumed service after lunch, we decided to take advantage of a space in the crowd and escaped to the drive the 60 miles to another site at Clérac – only five spaces and all services closed for the winter. We parked up anyway just for the night at least we’re a little bit closer to Spain (not much), and the aire was in a lovely setting right on the edge of a small lake (45.1792, -0.2282). The view from our cab! Not a bad spot to wake up at sunrise! The now nightly ritual of planing our course for the next day was completed and all points and map references noted. Apparently we’re heading for Fontet tomorrow which has such luxuries as electricity included in the price – we’ll see.